Nandi hills is a popular hangout for Bangalooreans. It is a hill 1478m above sea level. The attractions here include a garden maintained by Horticultural department, Tipu's drop from where Tipu used to kill his prisoners and a temple with a thousand year old nandi statue. On the way to the hills there are sunflower gardens and wine yards. 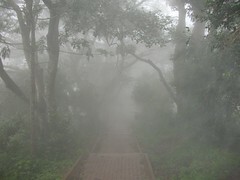 Barring the rainy months any other time is suitable for visiting Nandi Hills. September to May is the right time. There are many small shops selling snacks and cool drinks at the top of the hill. There is KSTDC hotel at the top which can be opted for food. They provide lodging also. Nandi Hills is 60km from Bangalore. Route 1: Bangalore - Hebbal - Yelahanka - Devanahalli - Nandi Hills. KSRTC runs only very few services to the place. Driving to the place is the best option.